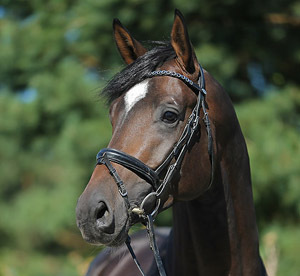 This exciting young stallion is a virtual clone of his world famous sire and shows similar talents as a dressage horse. Even though raised as a stallion, Frederic Fahrenheid is a gentle horse with impeccable manners. His work ethic is excellent, and he strives to please his rider. He has enjoyed professional training and is now an experienced 3yr old, coming 4 in 2014, with a solid foundation to build upon. His walk is exceptional, as is his ground covering, round and uphill canter that is marked by an especially expressive front arm. In the trot, he shows excellent self-carriage and in this gait, one can truly spot the potential he has to offer. Offered for sale only to a home where his performance potential and genetic background will be promoted. This is one of the last intact sons of Biotop, and one of the last horses that could uphold this rare, yet successful stallion line in the future. DOB: 2010, stands 16.3h. Located in Germany. Can be gelded upon request. Sire Biotop was an internationally successful Grand Prix dressage stallion with the late Dr. Reiner Klimke. Biotop, who was bred in Russia, came to Germany via Belgium and from his early appearances on, captured his audience like not many other horses. He was one of the Trakehner breed’s most successful dressage horses of the 1990, with multiple wins at World Cup qualifiers and other notable events worldwide. Genetically, Biotop combines some of the best Russian performance lines available. Essentially, his is a ¾ brother, upside down, to the two times Olympic show jumper Almox Prints J (who was by Hockey out of a Welt - Piligrim dam). Interestingly, Biotop’s offspring also usually jump very well. With Hockey and Eol, two of the most successful sport horse sires of all times are combined in this valuable pedigree. Hockey alone sired over 40 international competitors in dressage and show jumping. The basis of this pedigree lies at the Main Stud Trakehnen and horses that were brought to Russia after World War II. The Russian breeding program made good use of performance-proven Arabian and English TB stallions and both races had a tremendous impact on the high quality of the Russian Trakehner breed in general. Biotop’s pedigree is a nice reflection of this successful combination of bloodlines. 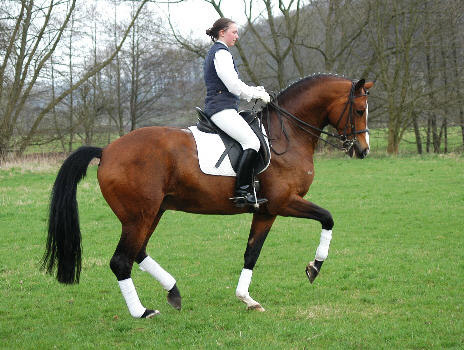 In Germany, Biotop was approved for the Trakehner breed based on his competition success, and later received the Elite title for the quality of his offspring. His son Goldschmidt was approved and is emerging as a top notch riding horse producer himself. His daughter Praise Me sold for 90,000.00 Euro at the 2011 Neumunster Riding Horse Auction. Biotop’s daughter Shakira was the National Champion Mare in Germany in 2002, and is dam of the approved, successful stallions Singolo (sire of the 2013 Champin Kissinger), San Silviano and Shapiro as well as the M/S level dressage gelding Starwood. Fleur la Rouge was herself successful at 2nd and 3rd level dressage (L), and is a maternal half sister to the 3rd/4th level dressage horse Farouge (M). 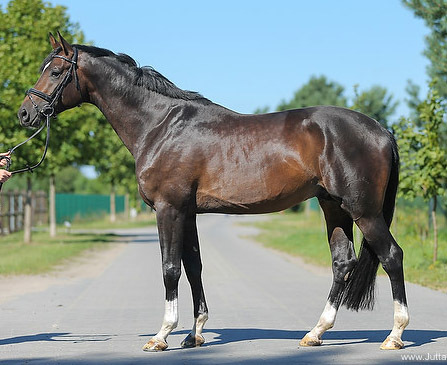 The dam sire Freudenfest was Champion in NMS in 1999 and is a proficient and very popular sport horse sire in Germany. 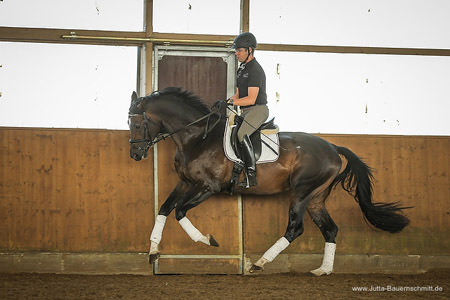 His get compete internationally in eventing and at S level in dressage. He hails from the dynasty that also produced the exceptional major sire Flaneur (e.g. sire of Arogno). 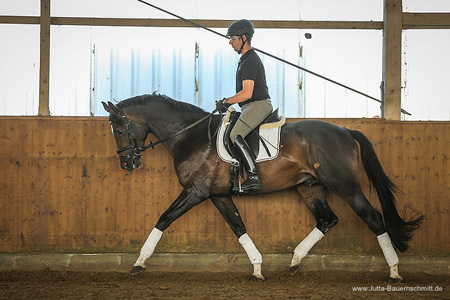 Freudenfest’s full brother Farinelli, NMS Champion in 1996, was successful at FEI levels in dressage (S). Grand sire Tolstoi was one of Kostolany's first approved sons in Germany and shared his dam Tugend with the international show jumper Trenk and Tiflis. 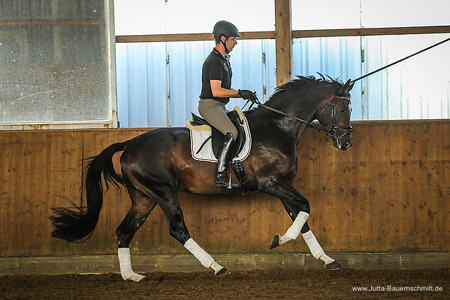 Kostolany of course needs little introduction in the world of dressage breeding. His son Gribaldi holds a top spot in the WBFSH rankings for several years now and one of the world's greatest dressage producers (e.g. sire of Totilas, Painted Black, Girasol and Sisther de Jeu). Kostolany is also sire of Silvermoon, whose daughter Matinee wowed the dressage world at the 2006 WEG in Aachen when she literally came out of nowhere and went home with medal honors for Denmark. 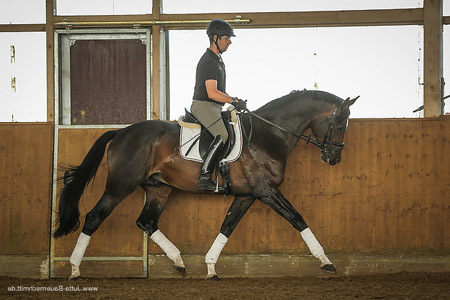 The combination of the world class dressage sires Biotop and Kostolany make Frederic Fahrenheid truly a unique opportunity. The East Geman family of Feldmaus is truly one of the best sport horse families in the breed today. No less than six international event horses came from this line in the last 10 years alone, along with upper level show jumpers and in hand driving horses.